It's week three of the Bob's Red Mill and California Olive Ranch Healthy & Tasty Cooking Challenge. This week the Virtual Potluck Group was asked to create a main dish using BRM Quinoa and COR Arbosana Olive Oil. For those that don't know Quinoa is gluten free, loaded with fiber and highly nutritious. It's also a complete source of protein making it an excellent option for vegetarians. One of my favorite vegetarian meals is Pasta Primavera. So I thought it would be interesting to try it with the Quinoa. 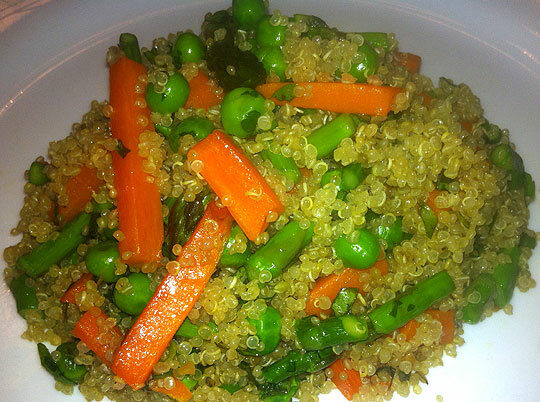 I sauteed a variety of diced vegetables in the peppery Arbosana oil and mixed them with the Quinoa. The result was very tasty...maybe even better than the pasta version. Be sure to visit the California Olive Ranch online store and use the coupon code BLOGFRIENDS for a 10% discount! Heat 1/4 cup of the oil in a large pot over medium-high heat until hot. Add the garlic and cook, stirring, until barely golden, 1 to 2 minutes. Add the carrots, reduce the heat to medium, and cook, stirring occasionally, until beginning to soften, about 3 minutes. Add the sliced asparagus and cook for 2 minutes, then add the asparagus tips, and peas; season well with salt and pepper. Cook stirring, until all the vegetables are just tender, about 2 minutes longer. Remove from the heat. Bring 2 cups of water to a boil in a large pot. Add the Quinoa and cover. Cook for 12 minutes or until all water is absorbed. Remove from heat and fluff. Cover and let stand 15 minutes. When ready mix with the veggies and chopped herbs. Drizzle with olive oil and serve. What a superb looking and healthy treat:-) Must try!!Bookmarked! Looks delicious! Love all the fresh herbs. What a awesome recipe...Delicious dear..
Looks Terrific and Healthy! Delish! I just started eating quinoa last year and I really love it now. I bet i could use some Arbosana olive oil to make quinoa cakes. Looks so healthy and delicious, I love asparagus. It actually grows wild near my house in the spring. Just tried quinoa on Sunday and everybody enjoyed it so I was pleased to see that quinoa and Arbosana olive oil were the ingredients being used this week. This has to be the most fun I've had in a contest. I'm anxious to try the Arbosana olive oil when this is all over with. My comment went thru without my name and email. I had said that this was the most fun I've had in a contest and I was anxious to try the Arbosana olive oil. I love that you made primavera with quinoa! A nice change from pasta. I have not made enough of Quinoa.. my sister gave me a great recipe for stuffed tomatoes.. but I just haven't tried it. I really have to get with it because this recipe with the parmesan and veggies sounds wonderful!! Love the colors and mix of vegetables. Arbosana works for me. oh Arbosana...the things you make me eat! I would love to try the Arbosana oil! Love all the veggies you crammed into the dish! Would love to win the Arbosana olive oil and quinoa! Your primavera with Arbosana olive oil sounds delicious!